Thermometers – both Thermapen for probing and the Thermoworks Smoke for Wireless remote monitoring. The technique we used here was a reverse sear where we slowly raised the temperature of the two pieces of Picanha by cooking it at 110°C until it’s internal temperature was 55°C for Mrs Smurfit and 50°C for the others. During this cook we used the Thermoworks Smoke thermometer to tell us both the temperature of the Egg (110°C) and the temperature of the meat. The initial cook was indirect, we used the plate setter feet up with the stainless grid on top. To that we added the meat and cooked slowly until the core temperature reached 50°C and 55°C (5°C lower than the temperature we were aiming for as the last 5°C would be achieved when we seared the meat). Next time I would suggest you aim at 58°C for Mrs Smurfit, maybe even 60°C. Vertical Roast Chicken is one of the easiest repicipes to cook. We essentially cooked the chicken at 180°C on the vertical chicken roaster for about 1hour to 1hour 15mins depending on how big the chicken was. You are looking to make sure the internal temperature of the chicken is above 74°C at the thickest part of the meat. When you cook chicken on a BBQ over lumpwood charcoal you may get what is called a smoke ring on your chicken. This is where the mioglobin in the flesh of the chicken reacts with the nitrogen and carbon dioxide and leaves the meat looking pink. The chicken is cooked but some people may mistake this for the chicken being under done. As with any meat it is always a great idea to rest your meat after cooking. I suggest resting a chicken for 20 minutes wrapped in foil. You don’t have to use a drip pan but if you do then you’ll be able to keep the juices for a gravy. Any metal pan from your oven is perfectly good. Dirty – cooked directly on the charcoal. This may sound odd but it’s one of my favourite ways of cooking it. The way we cooked the steaks was to do them at about 250°C on the cast iron grid, directly over the charcoal (no ConvEGGtor). Make sure you give the cast iron grid 10 minutes at 250°C to heat up before you start cooking on it. I prepared the rib-eye steaks by just sprinkling them with Maldon Salt. We then cooked them for about 2 to 3 minutes on each side. Rember the cooking time will depend on the thickness of the steak. To test the cook of the steak rember to use the thumb method. Where can I get videos on to help me use my Big Green Egg? The Big Green Egg UK Youtube channel has an excellent section called the Tips Series. These videos will tell you how to use your Egg. We cooked using the Thermoworks Smoke when we cooked the Picanha. This is my favourite wireless thermometer as it is so easy to use. It had a great range, you were ablt to take it all over the house. Temperature of the Big Green Egg using the clip on thermometer. Temperature of the Picanha using the food probe. With both of these probes remember to bring the wires out of the Egg over one of the legs of the ConvEGGtor (plate setter). This will prolong the life of the probes. You can buy the Thermoworks Smoke from here. You’ll have to import it from the US as they don’t sell them in the US yet. 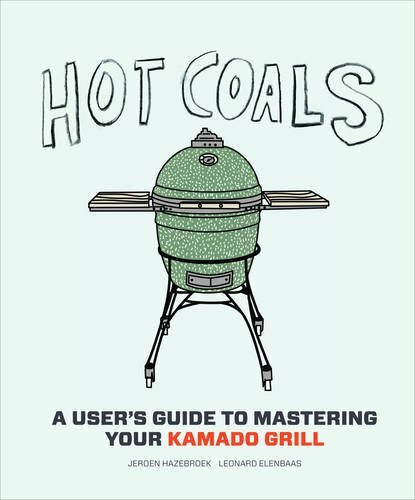 A good introduction to cooking on the Big Green Egg. It’s available on Amazon.